Last week, from July 4-8, some 50 people travelled to Queenscliff, Victoria, as part of the Swan Island Peace Convergence to enter into a week of protest and nonviolent civil disobedience to the war in Afghanistan. They came from as far away as Perth, Adelaide and Brisbane and as close as the small, sleepy seaside town of Queenscliff itself. The nonviolent resistance focused on hindering the operations of the Swan Island military base, a facility from which the Australian Secret Intelligence Service (ASIS) operates, and one which trains the Special Air Service Regiment (SASR), the elite fighters playing most of Australia’s combat role in Afghanistan. Our goal was total Gandhian transparency – as we said at our first meeting together, we didn’t know if there would be police present, but if they were they would be welcomed as we had nothing to hide. Plans and reflections were put up on our website. We had been liaising with police for weeks beforehand, telling them everything we knew, which precipitated what they called “Operation Swan 2,” a containment force of approximately 180 police members including water police, the dog squad and mounted police. Given there were never more than 20 of us at the gates at any one time, this amounted to a serious overreaction on the part of the state, a trust deficit we were keen to undo. Part of the reason for transparency was reduced fear – on the part of the participants (many of whom were attending their first “resistance” action) and on the part of the base staff and police. It is only in the context of reduced fear that people are open to changing their minds, and build the trust which is essential for working together and building an inviting movement. Another factor was honesty and truth – if nonviolence is “truth force” then the force of truth must be given a chance to win the day. If as Gandhi said, “we each have a piece of the truth and the untruth” then it is only in putting our truths together that we both discover a larger truth, and discern the untruth. The challenge is to design actions which most clearly demonstrate our truth, in a way which also makes clear our opponents’ truth, for people to discern. We chose to blockade as a way of publicly and visibly demonstrating our truth that those perpetuating the war through involvement in this base should not continue to do so. 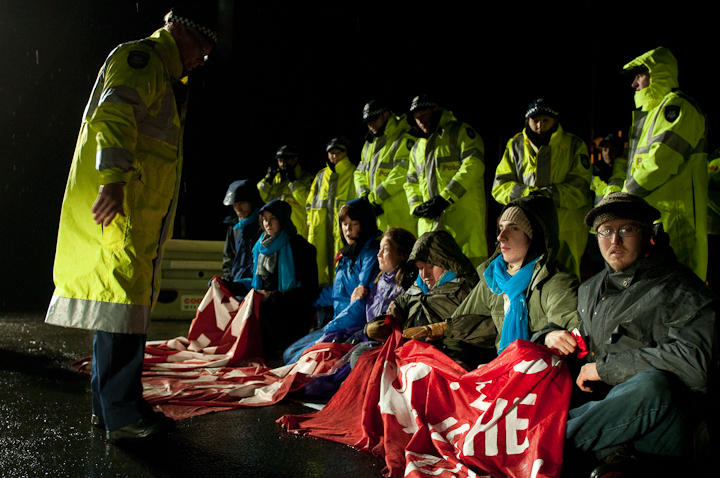 As such we began our blockades at 5:30am, when base staff begin to enter the facility. Despite, or perhaps because of, the freezing weather, our relations with police quickly became warm and amicable (as an example, we received numerous song requests, one officer even researching his song choice on his home computer between shifts). Instead of the usual one day action, five consecutive days enabled us to establish a pattern of disciplined behavior despite individuals coming and going over that time. Conversations revealed that more than half of the police agreed with our stance on the war (which is representative of the Australian population generally). But this difference between their personal views and their police role as agents of the state raised two questions: firstly, what does it mean that police individually believed the war should end, yet were prepared to defend this base and its involvement in that war? And two, how do we engage in a way which is friendly, open, and reduces fear, yet does not represent strategic collusion in the defeat of our aims? Regarding the first question, part of our challenge was to expose the myth that police were “just doing their jobs,” and were therefore a neutral presence. That happened through respectful but vigorous conversations, made easier by the more robust relationships we had built. We pointed out that their current role was not neutral, but had taken the side of allowing the military to continue its role in this war. We asked what they would have done in Nazi Germany, and cited the inspiring examples of police and military in Egypt and elsewhere, refusing orders which perpetuated injustice. We respectfully asked them to join us, giving them a range of options from turning a blind eye to some of our actions, to openly refusing orders, to quitting their job. The answer to the second question, of how you retain openness without colluding in your own policing, has been much more difficult. The relationship between the short term resistance to war and long term resistance movement-building (including police and military) is a complex and shifting one requiring constant discernment. On the one hand, being entirely open allowed police to plan to neutralise our blockading strategy somewhat, physically moving us off the road without too much difficulty (here some stronger techniques would have helped). Even then, with such disproportionate resources (people, money, time) at their disposal, police will likely outnumber and outdo us for sheer physical force for some time to come. On the other hand, not being entirely open also carries significant costs. Meetings need to be secretive, meaning only a certain elite have all the information, breeding mistrust, paranoia and internal power struggles. Police don’t know what they are dealing with, and may crack down harder out of fear-based reaction. This raises the bar of fear for everyone, making the participation of those on the edges of the movement less likely, reinforcing elitism and keeping the movement small. It also makes police and military collusion with us less likely as they are not even given a realistic opportunity to make considered choices. Personally, I’m keen to build a mass movement of embodied changemakers who will put their bodies on the line to stop or hinder war preparations or warmaking. I love the small group of people I work with and want to be working with them in 50 years time; but I’d also like us to be surrounded by hundreds, if not thousands of others. I’m under no illusions as to how difficult that will be in this deflated political environment, or how long it will take, but it seems to me to be a worthwhile project to which to commit my life. The Swan Island Peace Convergence ended with 10 arrests over four consecutive days of blockades but perhaps more importantly with some 50 people having been involved in a challenging, inspiring, empowering, fun series of events. We will continue to wrestle with these questions of strategy, principle and experimentation. But we will do so in the only way worthy of the struggle – actively, seriously, joyfully, and nonviolently. Excellent layout of the alternatives, risks and benefits, Simon. I affirm the strategies you have used for the sake of reducing fear on both sides and thus facilitating the building of relationships. For that, at the end of the day, is what reinforces your group’s integrity, the strength and attractiveness of the resistance, and the thoughtful responses by the police. I loved the story about the one officer who picked out songs for you to sing. Yes, the power and the warmth of witness in singing together is what has always powered successful resistance movements! The dismissal by the judge in the first round of arrests speaks volumes. And through some of those great interviews and articles in the press, one can only hope this has served to replicate the effect – getting people everywhere thinking about the implications of their complicity in the sinful business of perpetuating the war “machine.” Bless you all! exercise by any person of any lawful right to enter, use, or leave such premises shall be guilty of an offence. Penalty: 15 penalty units or imprisonment for three months. All you ferals had to do is obey the very reasonable law of doing your protest withOUT acting in a criminal manner,and I would not be scribing a syllable here. For the record, I did sing “All to Jesus I surrender” while in jail afterwards awaiting court. It was a beautiful moment actually. Jails have amazing acoustics. Yes, bless you all for your clarity of purpose, courage and persistance. Your commentary, Simon, is a blaze of hope and inspiration for what seems to be a newly emergent Peace Movement. May it grow daily! May it put an end to war entirely and for ever. Thanks Simon. This is very well articulated. I wonder if you could expand on what you see you might have been more successful in with a ‘successful’ secretive action? That is, what specifically did you ‘lose’ by being open? I am guessing it would be the length of each blockade. Why is that important in the scheme of things? At our last climate camp in the Hunter Valley (a coal mining area in New South Wales, Australia), we had a secretive action which everyone basically signed up for, not knowing exactly what it was. Given that ‘lots of people being arrested’ was, in a sense, one of the goals, it was felt that secrecy was necessary to achieve this. Certainly the lack of police at the critical location enabled vastly more people to sit down on the railway line than would otherwise have been the case. In hindsight I am amazed by how well it worked, in the sense of people generally not feeling disempowered (although some did) and that so many people – over 100 – were willing to risk arrest in that context. This was probably due to the very high levels of trust in the radical environmental movement now, itself born out of many actions together. I’m thinking about the sparking Bonhoefer action where four veterans of Talisman Sabre trespassers snuck (sneakily) onto the Island and materially interfered with infrastructure. This act captured the imagination of plenty in SE Vic. I reckon there’s a time and a place that’s best kept between activist and God until the right moment arrives. At the same time, the follow through actions described here by Simon are set to a different aspect of the same purpose. The blockade actions seem designed to be an accessible, “safe”, and nurturing means of bringing new folk into gentle confrontation with the security state. A single act, which hinders the operation of Swan Island, for a very low cost. In those circumstances, complete transparency brings big benefits for practically no negatives. At the same time the action Justin describes relied on a small amount of secrecy to make its most effective point. That numbers, in consent and cooperation, can stop trains. I am mostly transparent (especially to anyone who knows me), but I reckon there’s a place for discretion, and for neutralising police obstruction now and then. Police understand. It won’t break the relationship, it may even spice it up. Simon, you claim to be a “Baptist Minister” but your actions negate that title. You know as well as I do that Christ taught “Give to Caesar that which is Caesars” and that was said in the context of a Pagan emperor. You would have the legal and Christian ‘right’ to protest on the SIDE of the road, just as construction workers have the right to peacefully protest withOUT blockading building sites. But to deny access to a site (no matter what it’s use) under the Government’s control, you are denying Christ and His command to show that its the meek that inherit the earth, not the militant. You could do many things which were legal, but you chose to do the illegal. SHAME! You invoke the name of Ghandi? such a curious and short sighted narrow invocation when you would be fully aware that what Ghandi’s non violence achieved was one of the most violent sadistic and blood soaked wars of modern history in the creation of Pakistan and the ensuing mass killings and murders between Muslims and Hindu’s. Hi Julian. I hear that you’re distressed by our actions (by the way, this was the report of last year’s actions, I’ll be doing a report on this year’s actions soon). I wonder if you could engage this discussion in the spirit of seeking to understand rather than attacking, accusing and maligning. I’m open to learning from you, but know that we’ve thought through these kinds of actions long and hard, so perhaps you might even learn something from us. As for “rendering unto Caesar”, I’m sure you’re aware that its meaning is ambiguous in even the most cursory surface reading of that text. What is Caesar’s and what is God’s? Read with Psalm 24:1, for example, (“The earth is the Lord’s, and everything in it”), nothing is Caesar’s and everything is God’s (and rightly so). Jesus was certainly not above a little symbolic property destruction or blockading (see the temple cleansing, and Mark 11:16). As for blessed are the meek – this does not mean “blessed are those who do nothing about injustice”, in fact another beatitude is “blessed are the peacemakers”. What Jesus demonstrates time and time again, with his healings, his exorcisms, and his direct actions (most of which involve civil disobedience), is active nonviolent action, not passive acquiescence. Everyone who invokes Romans 13 always seems to lift it from the context of the rest of Romans, and in particular Romans 12. There we are encouraged to “present your bodies as a living sacrifice”, not be “conformed to this world” (which surely has to include warmaking) and “do not repay evil with evil, but overcome evil with good”. We, like Rev Dr Martin Luther King Jr. submit to the authorities in the penalty of imprisonment should they seek to impose it. Don’t forget that a large chunk of the New Testament was written from prison because Jesus’ followers did not see fit to “submit to the authorities”. Romans 13 can not be taken as a blanket prohibition on breaking the law – it is the way you break the law and the reasons for it that matter. I’m not sure how you can blame Gandhi for the violence between Muslims and Hindus, violence he worked scrupulously for many years to avoid and to undo. That would be like blaming me for the war in Afghanistan. I’m not sure how you equate nonviolent direct action with militancy either, that seems a long bow to draw to me. I’d suggest you come along to one of our actions to see the spirit in which they’re conducted, and you might get a different sense than you have. The irony of invoking Mill here is that you’re seeking to silence our free speech. All we have done is to embody our opinions rather than merely speak them – a significant upgrade in my opinion. We haven’t killed anyone (unlike those in the base – where is your passionate defence of Afghans’ free speech?) nor have we oppressed anyone. We merely used our own vulnerable bodies, bodies that could have been crushed or arrested or removed or killed by the State, because embodied opinion, particularly vulnerable embodied opinion with costs, is vastly preferable to merely expressed opinion. Jesus was not killed because he thought differently and merely tried to persuade people, but because he embodied the inbreaking Kingdom which was a challenge to the Kingdoms of this world. We seek to follow this Jesus and embody his inbreaking Kingdom. These are deeply theological acts we are taking, and just because you don’t understand them does not mean that your take on them is correct. I’d encourage you to adopt a more enquiring stance, and we may just come to understand one another – and the gospel – better. @ Helen. “Peace” movements are usually ignorant of history. You need only make yourself aware of the French Revolution “Liberty Fraternity and Equality” which was a nice ideal and Robispierre who led it went into it with the same noble sentiments you seem to hold. Unfortunately, he changed from not believing in capital punishment at the start to murdering 40,000 people at the end, including 2 of his fellow ‘peace’ warriors from the Legislature. At this point the rest of the legislature said to itself “If this is what he does to his friends, what will he do to the less filial?” and they promptly arrested him and had him executed. The end result was simply the replacement of the Tyrannical King with the Despotic Napoleon and the replacement of the Nobility with the Committee of public safety and the ridig control of ‘anti revolutionary’ thinking by using the police as ‘mind spies’ and basically bringing in their own form of secular ‘inquisition.’ The problem with your reasoning/thinking is that you are dealing not with ideal people, but with fallen people. The very first time Marxism was implemented it was by Lenin who made good use of the Machine gun and the ‘cull’ of politically incorrect people yet they spoke always about ‘peace’. Do you seriously believe that human nature will suddenly ‘see the light’ of your idealistic plea? It won’t… never has done, is not and never will. History is against you. But…I suppose if it floats your boat, you can’t do too much harm. @Bryan.. “between the activist and God” in connection with materially damaging Caesars property??? I don’t read of any such thing done by Paul or Peter or any of the disciples which makes me wonder which “God” you are referring to? Is it the one who said “Peace I leave with you; my peace I give you. I do not give to you as the world gives. Do not let your hearts be troubled and do not be afraid.” John 14:27 ? I do read of one ‘violent’ action of Jesus in the cleansing of the Temple, but that was specifically done for the fulfillment of prophecy as per Luke 24:44 When Peter drew his sword and attacked the slave of the High Priest Jesus rebuked Peter. I have a feeling he is rebuking you and your ‘secret activist plans’ right now if they involve criminal damage to Caesar’s property! Are you folks really “Christ-ians” ?